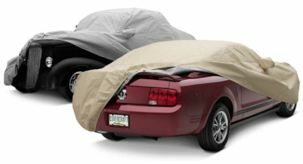 This car cover is made from 100% breathable non-woven fabric that allows heat, moisture, dampness, and condensation to escape easily. It completely blocks UV rays from the suns harmful rays that could damage your vehicles surface and interior. Front and rear under body elastic hems along with a left to right under body strap will help keep the cover secure during the windy season.